You are looking at a jetton which was made on 1904 to commemorate the Naval Battle between russian imperial fleet and japanese navy. 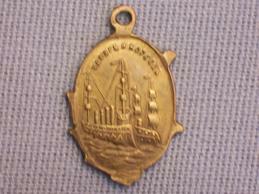 The jetton was made to commemorate the 2 ships (Varyag & Koreetcz) which was destroyed by the japanese navy. The obverse of this jetton shows a battleship with the inscription: "Varyag & Koreetcz". 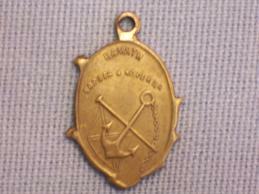 The reverse of this jetton shows an anchor perpendicular to Andreivsky Flag and a small inscription: "In Memory of Varyag & Koreetcz".